What role does each part of braces play? The brackets, bands, wires and even our oral health guidelines all play a vital role to the health of your teeth and the success of your teeth straightening. Braces have been perfected over the years to provide you various options for teeth straightening through traditional metal braces, lingual braces, ceramic clear braces, Invisalign and more. These options weren’t available in years past, and each option has been perfected to provide you quick and efficient teeth straightening. Find out why each part of braces is important and what role each piece plays when it comes to your oral health. Brackets – These are the small metal pieces that are bonded to each tooth center using special glue. This glue ensures that the brackets stick to your teeth. The glue is gentle enough that it can be removed once your time with braces has finished. Brackets are made of stainless steel but also can be made white (tooth colored) or clear. These brackets hold the archwire for the teeth. Wire – This wire is actually known as the “archwire”. It is the metal wire that connects all of the brackets together in your mouth. You will have one archwire that is along the upper teeth and one that is along the lower teeth. This wire curves around the teeth and puts pressure on the teeth so that they come into proper alignment in the mouth. This is the main player that works to move your teeth in the right direction. Ligature Elastics – These are the rubber bands that attach the archwire to the brackets on each tooth. Without these ligature elastics, the archwire would not be sturdy and couldn’t do its job. There are more than just these three parts of braces. Headgear – This is an external appliance used in orthodontic care to help realign the face and jaw during your time with braces. There is retraction headgear and protraction headgear. Retraction headgear is an appliance used to retract the upper jaw. Protraction headgear moves the upper jaw forward and into proper alignment with the lower jaw. Headgear will consists of a single strap that fits around your neck and attaches to the front of your teeth. There is a second type of headgear that attaches to your braces, but the headgear has straps that fit over your head and neck. Not all patients will receive headgear unless it is really needed. 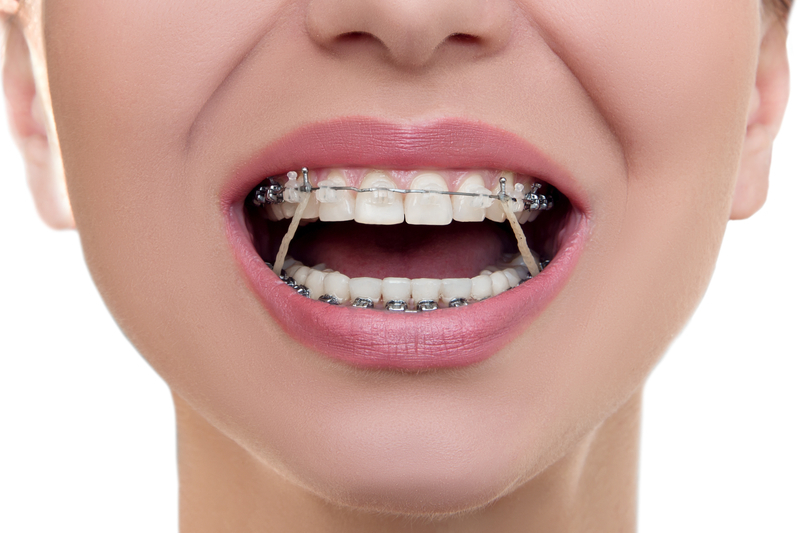 Springs – Many braces have springs to help push and pull the teeth in the right direction. These springs generally attach to the arch wires and are located between the brackets of each tooth. The purpose of the springs are to open up or close up spaces between the teeth as they shift. Elastic Rubber Bands – Some patients need the additional shifting power of rubber bands to help the teeth move into place on schedule. These bands are attached to the brackets and will go from a lower tooth bracket to an upper tooth bracket. You will receive these rubber bands at your checkup and instruction for attaching your elastic bands at home until your next checkup. Incognito Lingual Braces – These braces quite literally go “incognito” as they are hidden inside your mouth. You will receive the same type of treatment as traditional metal braces. However, lingual braces are a hidden treatment apparatus on the tongue-side of your teeth. The brackets and metal are attached here and straighten your teeth without anyone else knowing. Invisalign – Invisalign is one of the stealthiest forms of teeth straightening. It is a series of transparent aligners customized to your teeth. You will change these aligners every 1-2 weeks until your smile is straight. They are easy to clean, easy to remove for eating and sports, and are virtually invisible in the mouth. Clear Ceramic Braces – Instead of metal, these braces are made from strong ceramic. 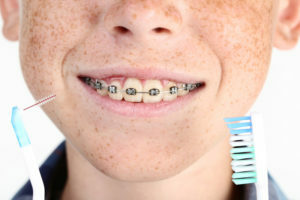 They appear very similar to metal braces but are colored to match the shade of your teeth so they blend into the mouth. Even the archwires can be made white. Retainers – You will receive a retainer after your orthodontic braces treatment has been completed. Wearing your customized retainer is vital to maintaining a straight smile, as the teeth can quickly shift out of place. The first month is the most crucial as this is the time when your teeth will shift the most if a retainer isn’t worn. Keeping the parts of braces clean will greatly enhance your experience, so following our guidelines will help you find success with your orthodontic care. Proper braces appliances and all their parts will ensure that your teeth shift into perfect alignment in the least amount of time. If you would like to learn more about braces or need to schedule your appointment, call our Belmar Orthodontics office today at (303) 225-9016!